Inoichi Yamanaka is the father of Ino Yamanaka. He is the head of the Yamanaka Clan of Village Hidden by Leaf. He is partnered with Shikaku and Choza since he was a genin and there is where Ino-Shika-Cho combination. He provided huge contribution to Fourth Shinobi World War with the Intelligence Division. He died along with Shikaku Nara and Mabui when Ten-Tail Beast fired Tail Beast Ball to the HQ during the Fourth Shinobi World War. Ninjutsu Mind Body Destruction Fance Jutsu [Prompt]: Causes light damage to a selected unit and to up to 4 units of the opponent’s formation suffering from Immobile or Sleeping. These units will suffer from Chaos. Ninjutsu Mind-Reading Jutsu: Very high chances of evading the Mystery Skills, Standard Attacks or Chase Skills suffered by this unit. Can be triggered once each round. Ninjutsu Chakra Inhale Jutsu: Every time the opponent Chakra Jutsu, gain the consumed Chakra by 100%. You can get Inoichi Yamanaka from the Great Ninja War Treasure. I’m not sure how many times you have to draw to get Inoichi but you will definitely get him with 20-40 draws. 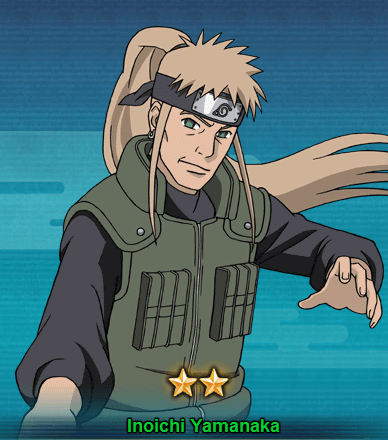 As you will be getting 2 star Inoichi Yamanaka initially, you have chances to get his fragments when you draw more seals scrolls from the Great Ninja War Treasure.